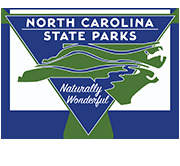 Enjoy a glimpse of the beauty of North Carolina State Parks through the pages of this brochure. It features vibrant color photographs and a fold-out map pinpointing the location of each state park and contact information. There will be a $.50 charge for each brouchure. These brochures are intended for individual use. If you are part of a business and you are in need of large quantities, please contact denr.dpr.web@ncmail.net.